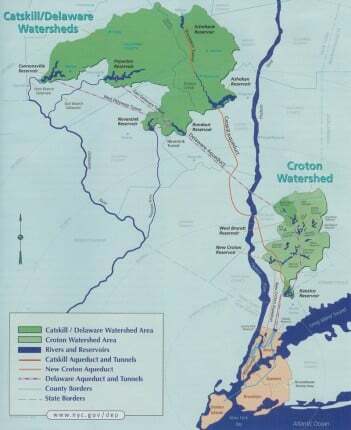 Over nine million people living in New York City, Westchester, Putnam, Orange and Ulster Counties enjoy clean, unfiltered drinking water from the Croton, Catskill and Delaware watersheds. The 6,000-mile network of pipes, shafts and subterranean aqueducts carries an average 1.2 billion gallons of pristine water each day from 19 upstate reservoirs. The City water delivery system is a remarkable engineering achievement and the single largest man-made financial asset in New York State. Four decades ago, the City of New York was known as the mecca of civil engineering and water delivery, and the City water supply was regarded as one of American civilization’s proudest engineering accomplishments. But the City’s reservoir infrastructure is now in a state of disrepair that threatens its ability to continue to supply the City with water. In 2001, Riverkeeper published “Finger in the Dike, Head in the Sand” exposing this deplorable state of disrepair. Years later, little has changed. Courtesy DEP – Click map to enlarge. While we recognize that the engineering required to fix the City’s crumbling infrastructure is complex, Riverkeeper urges the City to move quickly – from researching to repairing the problems. The Old Croton Aqueduct, built between 1837 and 1842, is no longer in commission. The New Croton Aqueduct, built between 1885 and 1890, is three times larger than the aqueduct it replaced. The New Croton Aqueduct stretches 31 miles from the New Croton Reservoir in Westchester County to the Jerome Park Reservoir in the Bronx and the 135th Street Gatehouse in Manhattan. The aqueduct draws on upstate reservoirs to supply 10% of New York City’s drinking water supply. Communities in Westchester County also withdraw water from the aqueduct. Being more than 100 years old, the New Croton Aqueduct’s tunnels and shafts are in serious need of rehabilitation. This aging infrastructure must be repaired in order to ensure the system will operate at current capacity into the future. Repairs to the New Croton Aqueduct are especially important, particularly if the Croton supply is more heavily used when the City moves on to repair leaks in the Catskill and Delaware Aqueduct systems. 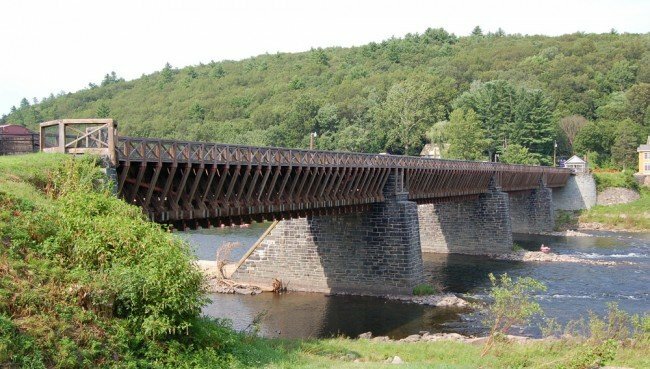 Constructed between 1937 and 1945, the Delaware Aqueduct draws from four reservoirs – the Cannonsville, Pepacton, Neversink and Rondout – to provide between 50 and 80 percent of the City’s daily water demand. The 84-mile aqueduct consists of three distinct pressure tunnels connecting the Rondout Reservoir in Ulster County to the Hillview Reservoir in Yonkers, and crosses the Hudson River at a depth of 600 feet below the river’s surface. With the bulk of New York City’s drinking water supplied by the Delaware Aqueduct, restoration of its deteriorating condition is critical. 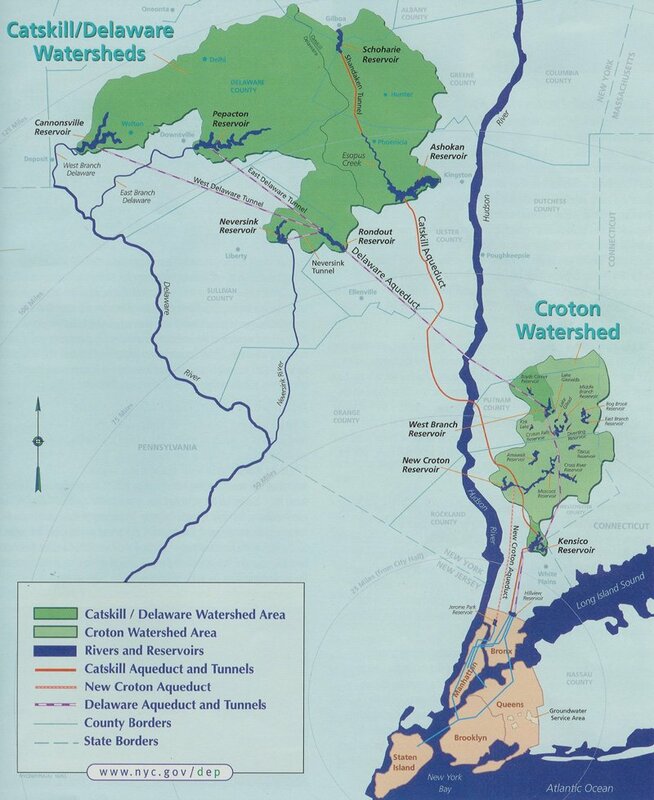 Two leaks in the Rondout-West Branch Tunnel, located at Wawarsing and Roseton, threaten the aqueduct with significant water loss or catastrophic collapse. Leak data indicates that the 33 to 37 million gallons per day escaping from the two leaks does not account for all of the water missing from the aqueduct. A leak below the Hudson River is an even more worrisome prospect. Although DEP has known of these leaks for more than 10 years, progress in rehabilitating the aqueduct has been slow.